The below article on Sri Shirdi Sai Baba has been submitted to Arunachala Mystic by Mr. Bharath Kumar. To read more of his articles please visit his own recently started site at this link here. Jesus Christ says in The Holy Bible "I am the Way, the Truth, and the Life" (John 14:6). 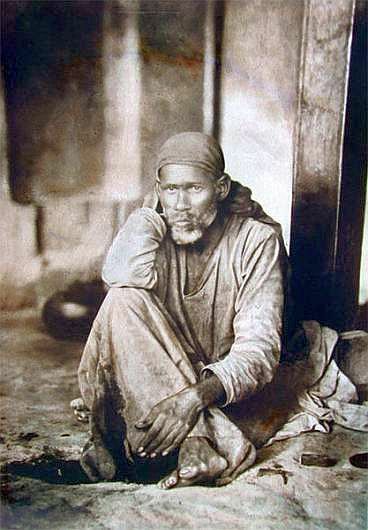 Similar was the life of Sri Sai Baba of Shirdi. Sri Shirdi Sai Baba – other than mischievously and jocularly accusing devotees (whom He was testing) through His instructive Leelas, had lived the way of Truth throughout His divine Life. A few instances in this regard from His life are described here from the Sri Sai Sathcharita. As guardian and custodian of innermost details of the past of all who knew Him, He revealed these details at the appropriate times to help correct devotees and steer them to the righteous path –and never for boasting or for publicly showing off His divine powers. Truth is not just about communicating accurate facts alone – but it attains divinity only due to the noble goals for which it is going to be used. Truth is about freeing ourselves from the unreal samsaaric worldly illusions and not about revealing inner/private or irrelevant but accurate facts of everything or everyone – which leads to gossip-mongering. Sri Sai stressed on these finer aspects of truthful behaviour. Once, Shirdi merchants jointly decided to stop giving free oil to Sai and all of them falsely told Sai that there was no oil to give. Sai then showed them His divinity by lighting lamps with water. When the merchants sought Sai's forgiveness, He advised them not to indulge in lies and forgave them. In one case, He intimated a person criticizing everyone (including Sai) by showing him a pig munching dirt and garbage and indirectly teaching him to have better control over his tongue (speech) in future. Sri Sai Baba said that in His place of residence (i.e. Dwarakamayi), no untruth was ever uttered. He also used to say that He would even give up His life just to keep His promises. This quality is akin to Sri Lord Ramachandra of Ayodhya (an embodiment of Truth with whom Sri Sai is compared to). Once, He scolded Nana Saheb Chandorkar (a close devotee of Sai) for avoiding and behaving high-handedly with a person requesting donation from him at his home. This incident, Sri Sai observed from Shirdi itself. Sai advised him to be truthful and polite to beggars/alms-seekers in future - whether giving asked donation or not. Sri Sai constantly reminded devotees to fulfill their vows to Gods and family deities – sometimes cryptically by sending them to where they had vows waiting to be fulfilled. As in case of Shama (a school teacher and Sri Sai's close associate) He directed him to go to a temple at Vani. Shama incidentally had a long-due family vow pending there – which he himself did not know! Same was the case of two gentlemen from Goa who forgot to fulfil specific money vows to God years ago in private! Sai also advised devotees to deliver exactly the items (whatever was entrusted to them) to be offered to Sai at Shirdi. Devotees were taken to task for mixing items and for toying casually with the money entrusted to be given for Sri Sai. If a devotee requested Sri Sai to have lunch at his home, Sai, if He did promise, always kept His promise somehow through various representatives who visited the said devotees at the appointed times – appearing seemingly from nowhere, but really master-minded by Sai's divine grace. In another case, a wealthy but miserly visitor who wanted Sai to teach him 'Brahmagyaan' (Supreme knowledge) in an hour while keeping a tonga waiting – was tested by Sai. Sai asked everyone around for five rupees money several times, but none had the sum. The miserly visitor heard, but kept silent as he was not asked directly though he had bundles of money with him. Sai told him unless he removes the attachment for money he had displayed, Brahmagyaan was difficult to attain. Both money attachment and Truth were thus tested here by Sai. Thus Sri Sai Baba practised and preached the righteous way of Truth steadfastly during his divine life.